A year ago around this exact time, I wrote a version of this same piece — highlighting remaining free agents who could still have fantasy value — and it was a dud. Seriously, click that link, read the piece. It’s pretty incredible. I listed 18 names in the piece, and by my count, only four of them even found a contract for last season. One was Anquan Boldin, who signed with the Bills and then promptly retired. One was Christine Michael, who signed with the Colts and then promptly hit injured reserve. One was Ryan Fitzpatrick, who did finish as the No. 3 fantasy quarterback in Week 6, but come on, that’s not a win for my side. But the fourth was LeGarrette Blount. And while Blount didn’t repeat his 2016 season with New England, when he finished as the No. 7 fantasy running back in standard leagues, he did have four double-digit fantasy weeks and was the No. 17 fantasy back in Weeks 1-4. He wasn’t a star, but for a guy who was unemployed until the third week of May, it worked out. The point is, players who don’t have jobs by this point are more often than not going to go through the season without fantasy value, if they go through the season in uniform at all. This isn’t about finding fantasy superstars in June. What it is about is finding possibilities. Blount had 816 yards from scrimmage and 3 touchdowns, then scored three more times and had 130 more yards in the playoffs en route to a Super Bowl title. Below is a look at players who are still out there right now and, while the odds are stacked against them, could still find their way into fantasy value in 2018. What, you were expecting Jay Cutler? The list of remaining free agent quarterbacks from 2017 is uninspiring, “led” by Cutler, Matt Moore, and suspended-for-four-games-even-if-he-gets-a-job Mark Sanchez. Meanwhile, yeah, Kaepernick’s career is probably over, but he’s been linked to the Seahawks in recent weeks, and if he ever does find a way back onto an NFL field, he continues to have QB1 ceiling. Kaepernick was the No. 7 QB in fantasy points per game in 2016. Any quarterback with his rushing ability carries intrigue, even if it’s unlikely. Really, he’s here because it felt weird to write this piece without a quarterback, but anyway, he does apply. I wrote about this at the start of free agency, when he, Adrian Peterson, Doug Martin, and Jonathan Stewart were all released and could have jumped the line to sign somewhere. In the end, Martin and Stewart got jobs, while Murray and Peterson remained (and remain) unemployed. In March, I concluded that Murray was the best of the group, with at least enough potential left in his legs to be part of a running back platoon. The problem for Murray (and the other backs here) is that the jobs are drying up with a quickness. With C.J. Anderson signing with Carolina this week, there isn’t an obvious landing spot left. Maybe the Colts decide they aren’t enamored with their rookie additions (Nyheim Hines and Jordan Wilkins), or maybe the Texans decide a free agent is preferable to the underwhelming Lamar Miller, but reality is, at this point, it’s going to take an injury for a free agent back to offer significant fantasy value. If Peterson gets a job, it’s going to be based on name more than anything else. He had a 43.5 PFF grade in 2017, second-worst among qualified backs, a bottom-tier 35.0 elusive rating, and only had five of his 156 carries go for 15 or more yards. He faces the same hurdles Murray does to getting work, but add in the fact that he isn’t actually good anymore, and even an employed Peterson isn’t a fantasy-appealing option. Lacy’s career has been confusing. He was ridiculously good his first two years, with PFF grades of 89.6 and 90.2, more than 3,000 yards from scrimmage, and 24 touchdowns across 2013 and 2014 combined. He fell off a little in his third year, and then his fourth season came around and he was barely NFL-caliber. The last two years, Lacy has barely topped 600 yards from scrimmage, hasn’t found the end zone, and only played 14 games. Still, by PFF grade, last year with the Seahawks was his first truly bad year, with a 68.5 grade. Whether the cause of this is his weight or something else, there hasn’t been even a whisper of Lacy rumor so far this offseason. His career might be over, and if it is, it’s going to go down as such a frustrating result after a phenomenal first two years. Vereen is unique on the market at this point. With Darren Sproles re-upping in Philadelphia and Danny Woodhead retiring, Vereen is the top available option for any team in the market for a pass-catching back (with Andre Ellington and Lance Dunbar as the other choices). It’s been a few years since Vereen was any good, but he still saw 52 targets last year with the Giants and caught 85 percent — among backs with 50-plus target, only Ingram had a higher percentage of targets caught. Vereen could potentially land somewhere where a team wants a receiving back, and if he does, he could at least be interesting as a low-end flex in PPR leagues. It remains weird that the Cowboys just dumped Bryant outright instead of reworking his contract — the team can contend with the Bills for the worst receiving corps in the league now. But dump Bryant they did. He still hasn’t put up a PFF grade under 70 and is just a year removed from 86.3; the end of Tony Romo, more than anything else, accounts for Bryant’s struggles. Dak Prescott had an average depth of target of 8.8 yards last year after 8.6 as a rookie; both numbers were in the lower half of the league’s quarterbacks. Pair Bryant with a quarterback more liable to throw it deep — maybe he could fit in Seattle, or maybe Buffalo will want him as a deep threat for Josh Allen/AJ McCarron. It’s just hard to envision an NFL without Dez Bryant this quickly. If he lands on a team, he’s an immediate flex play with WR2 upside. I thought the last two seasons pretty conclusively showed that Marshall didn’t have “it” anymore, with shrinking PFF grades, increasing injuries, bottoming out with 154 yards (and no scores) over five games in 2017. But news came out Wednesday that Marshall was visiting with the Seahawks, which would be his sixth career team and fourth in the last five years. Marshall’s skill set makes sense in Seattle — vintage Brandon Marshall would be an easy WR2 there — but he’ll need to prove he’s more than just a guy who looks the part before he would warrant any kind of fantasy investment. Marshall’s ex-teammate, Decker scored only one touchdown in 16 games last year after 14 across 18 games the previous two years with the Jets. Despite that, he totaled 563 yards and had a good-enough PFF grade of 71.8. His nose for the end zone would make sense with a team that needs a scoring threat, like Buffalo or Indianapolis, but even if he finds a deal he’s not going to give much beyond weekly DFS upside. Maclin had back-to-back thousand-yard seasons with the Eagles and Chiefs in 2014-15, scoring 18 total touchdowns, then dealt with two injury-plagued years and didn’t do much. He’s run roughly 50 percent of his routes out of the slot the last two years, so if he can find his way to a team that could use a slot man — the Jets or Bengals, perhaps — he could have weekly flex upside. Fleener is a real case in perspective: When he signed with New Orleans, the hype went way overboard, and he never stood a chance of meeting expectation (which I said at the time, lest I be accused of hindsight). But then emotions went too far the other way last year, and everyone was too down on him. Fleener was a borderline top-20 tight end on a per-game basis, even as the Saints went more run-heavy than before. The team released him this week, and while he’s never going to be a guy with the upside most envisioned for him before 2016, a team like the Lions that has Luke Willson and Levine Toilolo atop the depth chart could still make use of Fleener if they haven’t over-committed to the run. Several veteran tight ends find themselves on the outs right now. 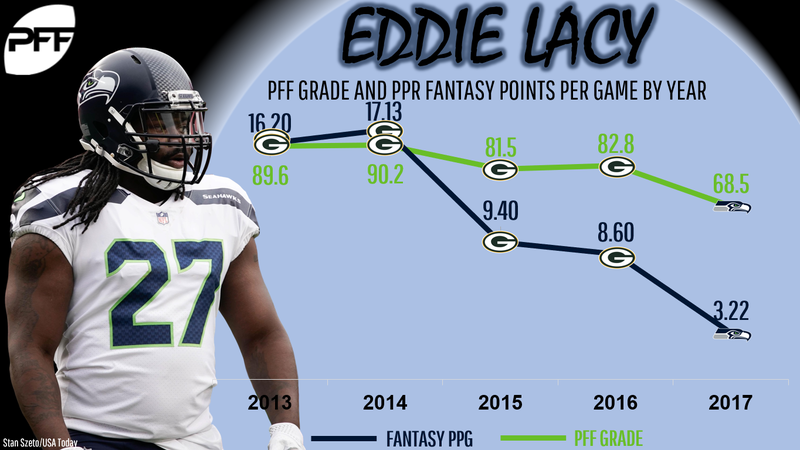 Lewis is a free agent despite having PFF’s best run-blocking grade at the position last year. Gates is unemployed after a long career with the Chargers and three scores on 44 targets last year. Thomas … well, he hasn’t been good in a few years now, but he had back-to-back 12-score seasons in 2013 and 2014, and that’s always going to attract attention. Can any of these tight ends be fantasy-relevant again? Well, the Seahawks are right there. With Jimmy Graham gone, the Seattle tight end group is now Nick Vannett, Ed Dickson, Will Dissly, and Tyrone Swoopes, which is … let’s say underwhelming. Give one of the available veterans a contract with Seattle — especially if the Seahawks don’t sign one of the aforementioned receivers — and we won’t have a choice but to consider those guys in fantasy.